“The Greater Mapungubwe network is a group of people living and working, or who have an interest in, The Greater Mapungubwe Area, who wish to share ideas and information. The intention of the network is to provide an opportunity to keep the sharehofer community abreast of current events and developments. It is not an activist group and will not become involved in decision making or problem-solving; it will provide a forum at which anyone may voice their concerns and at which they may assist one another with advice or inputs”. The Department of Environmental Affairs (DEA), in collaboration with the Limpopo Department of Economic Development, Environment and Tourism (LDEDET) and South African National Parks (SANParks), embarked on a process to develop an Environmental Management Framework (EMF) for the Mapungubwe Cultural Landscape World Heritage Site (MCLWHS). Nemai Consulting was appointed to prepare the EMF. 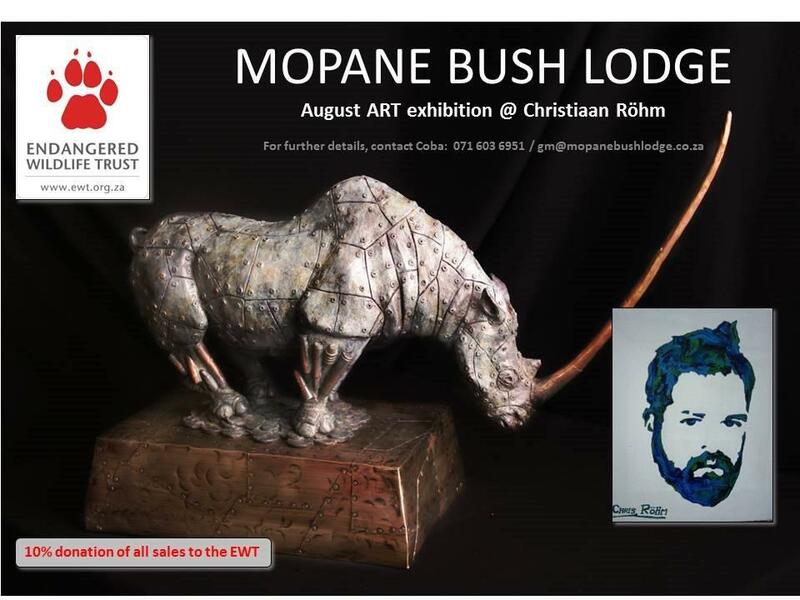 View the bronze sculptures of Christiaan Rohm in the tranquil surroundings of Mopane Bush Lodge. Exhibition to be enjoyed till 26th August. 10% of all sales go to EWT. Snacks will be available on arrival (courtesy of MRL), with a cash bar. No rooms available, only camping. Many thanks to Mogalakwena for sponsoring the event. Wilhelm Coetsee Botanica Natural Products. Social entrepreneurship:How a focus on the triple bottom line helps companies do well by doing good. Oldrich van Schalkwyk Lajuma Research co-ordinator Significance of temporal and spatial partitioning of an apex predator, Panthera pardus, in a complex mountain environment. Thank you to Mogalakwena River Lodge for hosting the event. Drive through Alldays towards Swartwater R572. Ten kilometers outside Alldays turn left at the first sign indicating Mogalakwena Craft Art Village and Tolwe onto the gravel road. Approximately 25km further, you will see a sign, indicating Mogalakwena River Lodge, where you turn right to the lodge gate entrance (if you reach the bridge you have driven past the entrance!). Once you have entered through the entrance gate carry on and turn left at the Mogalakwena River Lodge sign. Keep to your right and follow the road down to the river and the River Lodge. 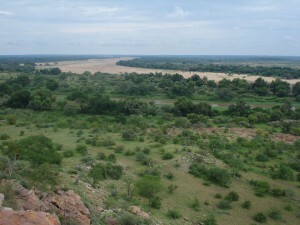 “As you may know, the Department of Environmental Affairs (DEA), in collaboration with the Limpopo Department of Economic Development, Environment and Tourism (LDEDET) and South African National Parks (SANParks), embarked on a process to develop an Environmental Management Framework (EMF) for the Mapungubwe Cultural Landscape World Heritage Site (MCLWHS). Nemai Consulting was appointed to prepare the MCLWHS EMF. If there are any errors, then please notify me and I will correct them for the next meeting. The date for the next network meeting is Wednesday 16 July here at Mogalakwena River Lodge. Please diarise the event, as it is a beautiful venue and we hope to have a fantastic line-up of presenters again. I’d like to thank in advance the staff from Mogalakwena Research Centre (MRC) and Lajuma Research Centre (LRC) for volunteering to assist with the organisation of future network meetings and newsletters. We have become ‘victims’ of our own success, and as the group has expanding with more members joining and wishing to contribute, it is now becoming a large task to co-ordinate. You’ll see from the minutes, that we have made the decision to reduce the number of meetings from four to three per year (with the same decision for the newsletters – which are still kindly sponsored by De Beers Group of Companies, Venetia Mine). The next meeting will be organised by MRC, with the final meeting of 2014 being organised by LRC. If you would like to present at the next meeting or have an item to be included in the next newsletter, then please email me the information and I will forward it to the relevant parties at Mogalakwena. Thanks for making the network such a success – we look forward to your continued support. And those who have not yet managed to attend the network yet …. We hope to see you soon. A very well-attended meeting took place at Moya. It really is heartening to see so many young folks, (from and old man’s perspective), taking an interest in and being so involved in conservation, extension and wildlife studies. A pity, though, I thought, that more of the scads of game farmers who live and operate in this area don’t attend these meetings. Perhaps they glean all the information and insight on subjects which affect their operations from other fora? Or perhaps they are so “Old School” and dyed in their ways that they think that they can’t be taught anything by these book-learned young whippersnappers? It should be said that I come away from every meeting having learned something new. The whole networking concept illustrates itself so well in the GMN, in that learned people who have something to offer to anyone who takes the time to listen, can be approached to discuss myriad subjects to do with developing this lovely area of South Africa. On this occasion, as previously, a number of presentations were to be made, as per the list appended to the agenda, which had a few small adjustments.